The high capacity unit H360HD2-EC4 forklift is available with the Cummins QSB6.7-155 diesel engine, a unique rear light cluster including turn signals, back-up and brake lights, as well as hydrostatic load sense steering. This particular model is also equipped with a 3-speed powershift transmission, VISTA mast, open operator cab and wet disk brakes. This empty container handler is agile and provides you the maneuverability, dependability and strength in order for you to be able to successfully and easily handle your toughest duty-cycle. The gas-spring gull wing doors and manual tilting cab make access to more than 95% of the serviceable items quick and easy. The H360HD2-EC4 offers an excellent balance in overall unmatched performance, unsurpassed serviceability and total operator comfort. Hyster's H190-360HD2 series unit is defined by its excellence from beginning to end. On this specific unit is the ComforCab II, that is an operator compartment which features an uncluttered floor design, hydraulic controls, and load sensing power steering. The exclusive Vista Mast offers unequaled visibility for the operator. Supreme attention to detail in the ergonomics department is put into each of these machinery. The dependability and excellence are all designed to help increase the efficiency of your operators. The ComforCab II models are also equipped with side tilting capabilities. The engine, transmission in addition to other service check points are located conveniently to enable quick maintenance. This attention in the design allows daily service checks the ability to be completed in less than 10 minutes. This equates to a lower organization expense to your company. Hyster features their exclusive Vista masts. These masts are comprised of an overhead guard and widely spaced channels to offer you with the best all-around visibility for more efficient load handling. The equipment's diagnostics part has also been simplified by introducing a top-of-the-line multi-function display panel. This panel provides at-a-glance information with 5 gauges, 16 warning lights and a dual function LCD. Around the world, Hyster is recognized for offering a whole lineup of great material handling equipment. These kinds of machinery are manufactured with the operator's safety and comfort in mind. They have proven to be dependable and reliable in even the harshest of situations. Hyster remains innovative and consistent in their equipment designs. These types of machines are built to last and complete the task efficiently and effectively. These are just a few of the reasons that the Hyster Company has become one of the leaders in the industry. 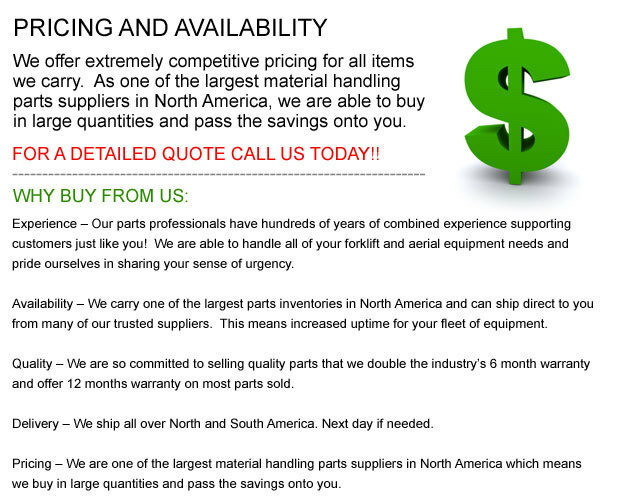 Copyright © 2010-2019 forkliftpartsnorthcarolina.com All Rights Reserved.